I always love white flowers! what lovely blossoms you have here. Thanks, Maia, for hosting! Oh wow, so beautiful! I love them! Yes, so beautiful white flowers.. i loved it.. you have great pictures here.. I will keep coming over here to see this wonderful place. 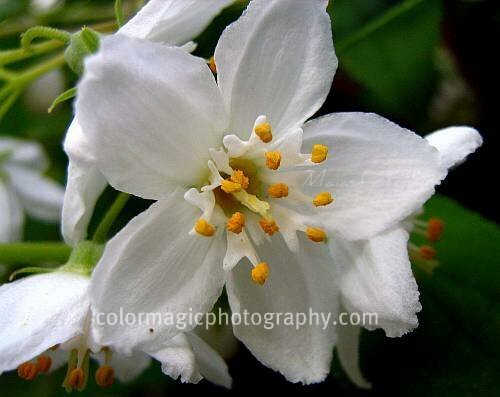 Beautiful white flowers...i love the yellows in it too. Happy TG. I will visit everybody later! 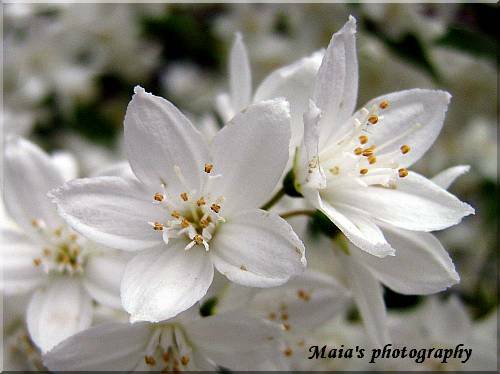 Beautiful white flowers, and so pure looking..Happy Thanksgiving, Maia.. Thank you Rosie for your kind invite. I may stop by tomorrow. it is universal, white is purity in all cultures. Thanks so much for inviting me back! I like your challenge very much! As I don't have any flowers here at the moment I can't participate today, but definitely plan on it! Thank you for well wishes! I like how crisp the flowers are! Can't wait till spring so we can see more flower blossoms! White flowers are always welcome, but typically the flowers given at Thanksgiving holiday have shades of yellow and orange, or fall-type colors. This is a beautiful macro, as always.